In December 1931, Dhyan Chand led Jhansi Heroes to victory against Manavdar. The Nawab Sahib presented a 'Khillat' to Dhyan Chand, remarking that he was too big a player to receive just an ordinary medal. In 1933, Dhyan Chand achieved a personal ambition when Jhansi Heroes won the prestigious Beighton Cup. Dhyan Chand never forgot this particular tournament because he suffered a serious attack of dysentery and there was danger to his life. ack home in Jhansi, Dhyan Chand recounted the tales of the Olympics to his friends. School children and players came to his house to listen to his stories. By this time, his brother Roop Singh had started taking an interest in hockey. Whenever Dhyan Chand talked about the game, Roop used to come and listen. Roop Singh learnt most of his hockey playng in Jhansi. Dhyan Chand used to correct Roop Singh's game whenever they played together. 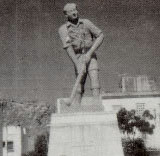 Dhyan Chand eventually formed the Jhansi Heroes hockey club. The team participated in the Scindia Gold Cup tournament in Gwalior, and also the All-India Rabia Sultan hockey tournament. In December 1931, Dhyan Chand led Jhansi Heroes to victory against Manavdar State. The Nawab Sahib of Kurwai presented a 'Khillat' to Dhyan Chand, remarking that he was too big a player to receive just an ordinary medal. The following year, though Jhansi Heroes lost in the Beighton Cup, Dhyan Chand helped his team win the Willington Trophy soon after. Jhansi always had a special place in its heart for Dhyan Chand. When he went to Jhansi after winning the 1932 Olympic hockey gold, a big procession followed him to his home. A welcome arch was made of hockey sticks, and a school was closed for half a day in his honour.